I must admit I was somewhat drawn in by the August Rush trailer. Sure it looks like it might be a bit cheesy, schmaltzy and most definitely a blatant tearjerker. The movie tells the story of a charismatic young Irish guitarist and a sheltered young cellist who have a chance encounter one magical night above New York’s Washington Square but are torn apart, leaving in their wake an infant, August, orphaned by circumstance. So you've got Freddie Highmore (Neverland) as the precocious orphan who seems to be channeling Haley Joel Osment circa The Sixth Sense. The star-crossed lovers are played by Keri Russell (she's a little bit classical) and the delicious Jonathan Rhys-Meyers (he's a little bit rock 'n roll) who reminds me of a younger, cuter Joaquin Phoenix. Add an always energetic Robin Williams who plays a Fagin-esque character and Terence Howard (Crash) to round out the cast. The tagline for the movie is "An incredible journey moving at the speed of the sound" so it's no surprise that the soundtrack is a diverse collection of musical influences--classical, guitar, jazz and even gospel. What was surprising is that Jonathan Rhys Meyers is a featured performer on four of the album's fifteen tracks--including a soulful cover of Van Morrison's Moondance complete with a mournful harmonica solo. The soundtrack also includes John Legend performing the song Someday, the gospel inspired Raise It Up featuring Jamia Simone Nash, a cover of Billie Holiday's God Bless the Child by Paula Cole accompanied by trumpeter Chris Botti and a sultry sounding cover of La Bamba performed by Leon Thomas III. 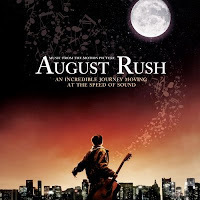 The movie will be in theaters beginning Wednesday, but the August Rush soundtrack is available in stores now.